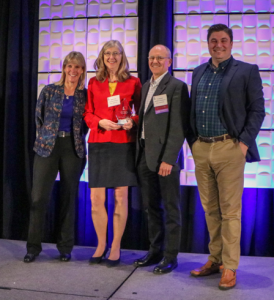 NSIV has won the “Dinah Adkins Technology Incubator of the Year” award presented on April 23rd at the InBIA’s 32nd International Conference on Business Incubation, held in Dallas. Naturally, Marty and Tom were on hand to accept this prestigious award. The conference draws more than 600 entrepreneurship support professionals to learn industry best practices and discuss the latest trends. InBIA is the International Business Innovation Association. Read the press release. Pictured with Marty Farmer and Tom Kinneman, on the left is Kirstie Chadwick, InBIA’s Executive Director and on the right, Jamie Coughlin, Chair of the Board of Directors.